A poster celebrating the career of Michael Schumacher has been released in an effort to raise money for the Keep Fighting Foundation. Produced by Zoom, a charity organisation which has a long involvement in Formula 1, the poster depicts Schumacher en route to victory in the 2000 world championship. It’s the second in a ‘Champions’ Series’ of five posters all of which will raise money for charities local to the driver. Previously Zoom has produced a book with drivers and other paddock insiders acting as the photographers. “The posters were launched two years ago as a spin-off of the Zoom initiative which involves all of the F1 drivers and team bosses taking photos of anything they want so that they can be signed, framed and sold for charity,” Chris Sylt, one of the founders of Zoom, told Speedcafe.com. “I came up with the idea in 2012 when I realised that the existing charity auctions in F1 all tend to follow the same format which is offering signed photos of the drivers, usually in very wooden poses. 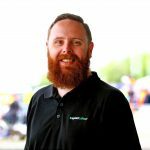 “The photos have raised more than £100,000 for Starlight and Great Ormond Street Hospital – two UK-based children’s charities which were selected by F1. 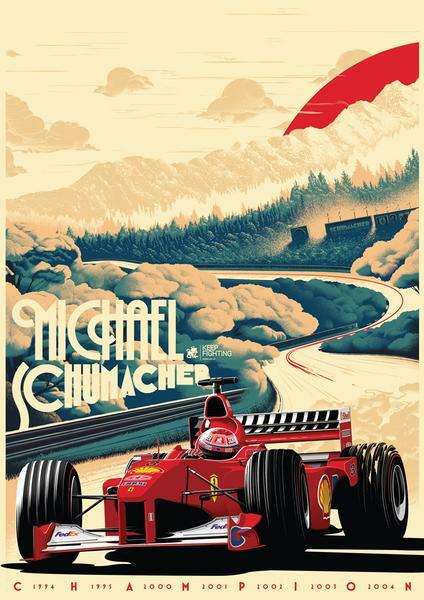 The Schumacher poster aims to raise funds for the Keep Fighting Foundation, which uses the positive energy generated for Michael Schumacher to help in areas such as culture, education, science, public health, and even road safety awareness. CLICK HERE to visit the online store to purchase this poster.